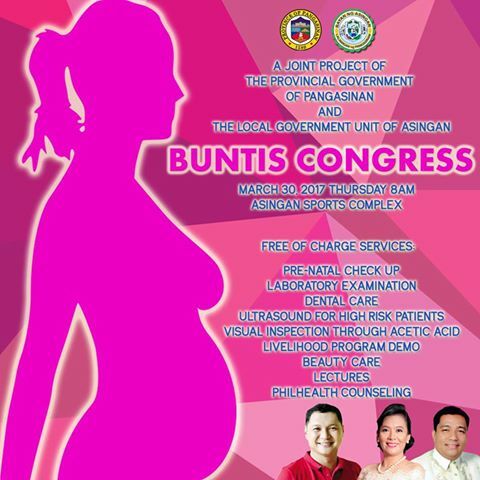 The Provincial Government of Pangasinan in coordination with the Provincial Health Office and the Municipality of Asingan will be conducting “Buntis Congress” on March 30,2017 at Hon. Sapigao Sports Complex. This is an awareness campaign project for pregnant women in support to maternal and child health before, during and after pregnancy, which aims to intensify the promotion of the importance of good health and nutrition. The Provincial Health Office will provide free services such as laboratory examination, pre-natal checkup, ultrasound, visual inspection through acetic acid, beauty care, dental health care, livelihood program and counseling.